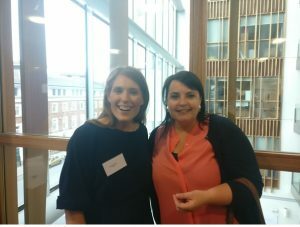 The Royal Academy of Medicine in Ireland’s Section of Biomedical Sciences Annual Meeting was hosted by TCD Physiology in the Trinity Biomedical Sciences Institute on 22nd June 2017. The day started with a welcome address from the Section President Prof Veronica Campbell (TCD) followed by the opening of the Donegan Medal competition by the Section Secretary Prof. Ken O’Halloran (UCC). Twelve first-time presenters battled for the Donegan Medal and the standard was so high that both winner (Deirdre Scully UCD and Nicola Kavanagh RCSI) and runner-up places (Orla Haugh TCD and Bibiana Mota TCD) were shared. A first for the meeting! A jam-packed poster session with contributions from RCSI, UCD, TCD, UCC, Dundalk and DCU along with many national and international collaborators kept us busy during coffee time – a really great festival of science. A respite from competition allowed us to thoroughly enjoy the Conway review lecture delivered by Dr. Stephen Keely (RCSI) who provided a fascinating account of bile acids through the ages, from traditional Chinese medicine to current-day therapeutics. Oral communications followed from Dr. Gerard O’Keeffe (UCC), Michelle Smith (UCD) and Sarah Wade (TCD). The competition kicked off again for the Barcroft Medal where we were treated to some riveting data delivered by postdoctoral researchers from as far flung as the University of Nevada! The breadth of topics was extensive and included Parkinson’s disease, autoimmunity, breast cancer and immune metabolism culminating in calcium signalling stealing the show with a well-deserved winner in Dr. Bernard Drumm. After an intensive deliberation by the judges, the prize-giving ceremony was held at the wine reception and winners were bestowed with their prizes by the Section President and Secretary. The scientific dialogue continued over dinner at Quay 16 where we consolidated our newly acquired knowledge – a deeply enjoyable day!